Pay no attention to those thermometer readings in Dallas or Cincinnati, pumpkin beers are on the way and fall can’t be far behind. 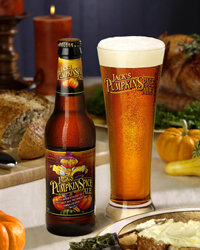 Anheuser-Busch this week announced the return of Jack’s Pumpkin Spice Ale, first released in 2005. More pumpkin beers distributed nationally, regionally and locally will soon follow. Brewed with seasonal spices and Oregon-grown Golden Delicious pumpkins at A-B’s Fort Collins brewery, Jack’s (5.5% abv) pairs with traditional dishes such as turkey dinnners and pumpkin bisque, but also others like like teriiyaki chicken and mild Italian sausages. Jack’s Pumpkin Spice Ale is brewed with two-row, caramel and carapils barley malts, a blend of imported and domestic Hallertau hops and domestic Saaz hops. You may be living in a Pumpkin Beer wasteland. Weyerbacher Brewing Co. Imperial Pumpkin Ale, Shipyard Brewing Company Pumpkinhead Ale, Dogfish Head Craft Brewery Punkin’ Ale (Pumpkin) & Matt Brewing Co. Saranac Pumpkin Ale. Two of those, the Weyerbacher and the Dogfish Head, are among the best in the country. Or maybe I’m just living in the Best. Beer. Region. In. America. I just checked the Official Criteria for Best Beer Region in America. No mention of pumpkin beers. But I was too cheap to buy the 2007 version so maybe something changed. I’ve personally been anxiously awaiting the arrival of Dogfish Head’s Punk Ale in my area. There’ll be a very narrow window of availability once it’s here though. Seems to vanish very quickly though in the limited few beer haunts I’ve found that have featured Punk Ale in stock each fall in my area. I’m not a fan of flavored beer but I do like Buffalo Bills Pumpkin Ale. Not sure about this Bud version.